Ladislav Zátroks Company - Alnyk Furniture has been since 1992 engaged in the restoration and sale of original rustic/rural/antique furniture, which is traditionally of great interest, especially in the EU countries where we sell the bulk of production. 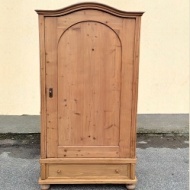 Other services include stripping, subsequent repair and restoration of old damaged furniture, possibly bought from you. We offer custom made stylish interiors or kitchens. There is plenty of choice of Rustic furniture in our catalogue. We have been engaged in selling rustic furniture since 1992. Commission your very own unique kitchen or piece of furniture. We offer stripping and refinishing for companies and private persons. Our services are comprehensive: from graphic design to installation. We have our own transport trucks Mercedes Sprinter and Ford Transit.